Work at height has a long and varied history, and the pace of changes in recent years show that it is in no danger of slowing down. Working at height is so often an essential part of life for people employed in a range of industries – construction, telecommunications and offshore to name but a few. Legislation and processes have evolved over time to help mitigate the risks of working at height, including eyebolts to secure ladders via straps, fall protection equipment with personal rope and harness systems and safe chimney and roof processes. Indeed, major organisations, such as BskyB, started in the early 2000s to attempt to ensure the safe lone working of its staff by introducing Working at Height (WAH) training and basic standard equipment, such as ladder stabilisations, battery-powered hammer drills and basic PPE such as hard hats and working boots. Despite great efforts to tighten regulations and numerous campaigns to raise awareness about the issue, falls from height remain the most common cause of workplace fatalities. In the UK alone, more than 40 people are killed and 4,000 are seriously injured every year. Taking Britain as an example, more than one million businesses and 10 million workers are estimated to carry out jobs involving some form of work at height every year. Away from the statistics, high profile accidents involving falls from height have made the headlines, sharpening the focus on the dangers and the reputational damage such health and safety failures can deliver. In Brazil, the lead-up to the World Cup in 2014 was overshadowed by media reports of the death toll on construction projects, including the fatal fall from height of a worker in Sao Paulo. If the human cost of such failures is our foremost cause for concern, the reputational and financial costs of such lapses give more reasons for investment in properly managing the risks. A wide range of guidance, training and even product standards have been updated and introduced over the last few years, and more are around the corner. There is a good reason for this constant change – Reporting of Injuries, Diseases and Dangerous Occurrences Regulations (RIDDOR) figures released for 2013/14 confirm that, as touched upon earlier, falls from height remain the main cause of major injury and death in the workplace. Worse still, fatal falls have remained steady in recent years even as figures for other types of fatal injury have improved. In 2013/14, slips, trips and falls accounted for more than half of all major injuries to employees. Falls from height specifically were the biggest cause of fatalities – almost three in every 10 fatal injuries during the period were caused by falls. Efforts to change and improve work at height by the Health and Safety Executive (HSE) and a range of trade bodies are being made in an attempt to change those flat statistics. Between new and updated product standards, the latest regulations and a wide range of guidance, there is a lot to keep up with across the work at height industry. The biggest changes are best summarised and explained at the events taking place throughout the year, for example, at the Safety & Health Expo (SHE) taking place 16-18 June. For the second year running, SHE will be held at London’s ExCeL, with work at height experts available to speak with. Ahead of this is the IPAF Summit, set up by the International Powered Access Federation (IPAF). Taking place in Washington DC, USA on 26 March, the Summit will provide insight into the future of work at height. JLG’s Frank Nerenhausen will deliver a keynote speech under the title ‘Gimmicks or the Next Reality’, which will explore future issues in depth. The Summit’s overall theme, ‘New Technologies and New Markets’, also looks to the emerging future of work at height. Aside from this year’s events, the latest change in 2015 has been the introduction of an updated product standard: BS 1139-6. This development provides up to date specifications for the advanced equipment used on complex towers. Along similar lines, the PAS 250 specification for low level work platforms is now used by all members of industry body PASMA and is on course to become a full BSI standard. Whether using towers, ladders, MEWPs or any other type of access equipment, keeping up to date with the latest standards is vital. Just as important is the guidance that helps people navigate these regulations and standards. Last year the HSE published two new pieces of guidance on working at height, aimed at making it as simple and safe as possible. Following the guidance ensures that workers do as much work as possible on the ground before moving on to higher level work, that they think about access to the work at height area rather than just the area itself, and are aware of the dangers and procedures to be used during the work. Mainly, this involves simple tips such as avoiding overloading and overreaching, being aware of the danger of fragile surfaces, protecting against falling objects, and understanding emergency evacuation and rescue procedures. INDG401 covers all this in just seven pages, and also discusses how to comply with regulations, understanding competence, the different measures used to protect people, common causes of accidents, planning the work, and what should be done by employees, architects and building designers. INDG455 covers the same ground, but focuses specifically on ladder use. It notes that appropriate training can be important, summarises the process for inspecting ladders, looks at which ladders to use for which jobs, and covers all of the basic rules to remember when working on a ladder. Looking at guidance around the world, in April 2014 a report was carried out by the Centers for Disease Control and Prevention, in the United States, which highlighted ladders as the leading cause of unintentional fatal injuries, and that 81 % of fall injuries in the construction sector involved a ladder. This is why a number of US agencies – the National Institute of Occupational Safety and Health (NIOSH), the Occupational Safety and Health Administration and the Center for Construction Research and Training - announced a national campaign to prevent workplace falls, and why NIOSH is developing innovative technologies to complement safe ladder use. In the United Arab Emirates, the Abu Dhabi environmental, health and safety management system regulatory framework (AD EHSMS RF) is an integrated system that takes into account all aspects related to protection of the work environment, and the health and safety system of the workers. 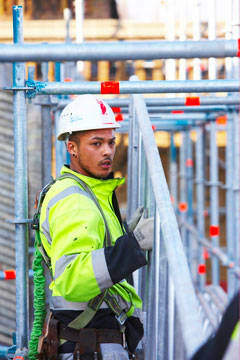 It features a code of practice relating to working at heights, which covers the requirements relevant to planning, preparation and conduct of health and safety work practices in connection with working at heights. In 2012, a campaign was launched that aimed for a five to 10% reduction in fatal occupational injuries from falls and falling objects. This has been credited with helping to achieve a 32% reduction when compared to the previous 12 months, or 16 less worker deaths after implementation of the programme. A new online resource, WAHipedia, is currently being set up that will help ensure people can remain aware of the standards, regulations and guidance affecting them, even in the rapidly changing work at height industry. The HSE’s brief guide also provides information on how to decide if the people working at height are competent. Only people with sufficient skills, knowledge and experience should be employed to perform the task, or, if they are being trained, they should work under the supervision of somebody competent in the required task. The provision of the right equipment is worthless if the right worker behaviours are not in place. This is why accessible advice and guidance are imperative. One of the key challenges is to engage with people who might not always hear safety messages, such as the young and those new to work. Health and safety is moving into a new era and we need to ensure that our information reaches those that need it and that it is in the right format to be translated into knowledge and practice. Work at height has been undergoing one of its busiest periods of change in recent years. Between the updates already made, those on the horizon, and the ongoing struggle to make the whole process safer and better understood, it is more vital than ever that everyone working at height remains up to date with the latest changes and guidance.